Effective presentations have a structure and flow. An effective way of building the structure of your presentation is to imagine yourself answering the audience’s questions. This is what Al Gore did in his latest TED talk. Do we have to? Why is this so urgent? By discussing the problem first, Gore persuaded us that action is necessary and urgent. Although most of his audience would have been familiar with this issue – revisiting the issues and making us aware of the latest information had us ready to listen and take action on what was coming next in his presentation. The lesson to take from this is that making your audience highly aware and sensitized to the problem is a critical element of persuasion. OK. So what should we do? Gore then told us that there are solutions and gave us his perspective on them. The listing of these solutions is straightforward. But it seems so hard. Can we really do it? But he’s very aware that people are often stopped from taking action and implementing solutions because the problem just seems so big and so tough and the so the essential third part of this presentation is focused on inspiring us, to show us that it is possible and to look past the short-term hardship. He gives us the 1,000 year view! 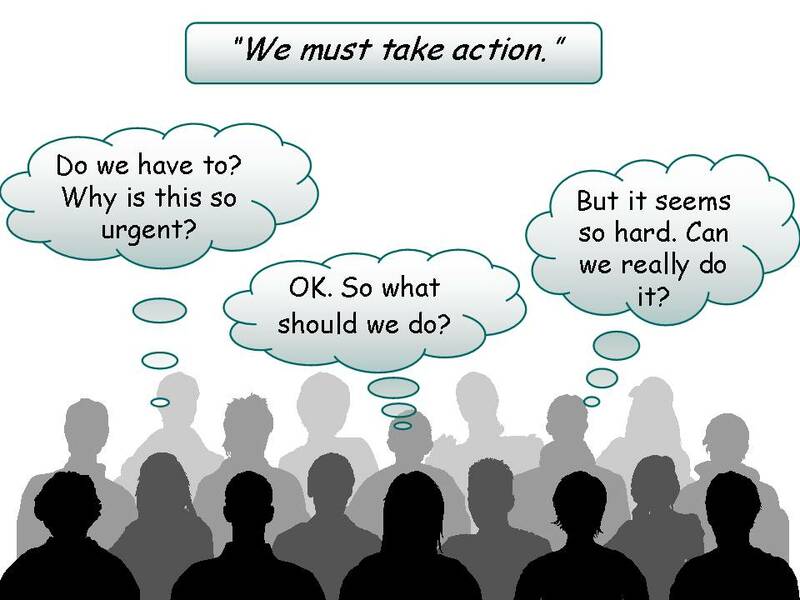 That’s the final and necessary step in persuading and motivating us to take action.